Rutgers head coach Kyle Flood, center, standing with his players after defeating Syracuse 23-15 in Piscataway, N.J. in October 2012. Rutgers announced that November that it would join the Big Ten. Maryland accepted an invitation to join the Big Ten Conference on Monday. Rutgers did the same on Tuesday, expanding the conference’s roster to 14 teams and its footprint to the East Coast. The new additions would bolster the Big Ten’s reputation for strong academics. Both universities are members of the Association of American Universities, as are all current Big Ten institutions, with the exception of Nebraska. Their athletic heritages are mixed, however. The Rutgers football team has finished the season ranked in the Associated Press top 25 once in the last 35 years, although it is currently ranked No. 21. Maryland’s football team has finished the season as a ranked team eight times in the same period. Its basketball team has had more consistent success, winning a national championship in 2002. But the main rationale for adding the schools seems to be economic: the prospect that they would give the Big Ten, and its cable network, access to the New York and Washington media markets. Moreover, affinity for college football is considerably lower in the Northeast than it is in the Midwest or the South. Thus, the teams have fewer fans than most other current Big Ten members. Last year, I conducted an analysis of the 120 members of the N.C.A.A.’s Football Bowl Subdivision, attempting to estimate the number of fans devoted to each program. Next, the college football fans in each market were further divided between F.B.S. schools, based on the results of an Internet-based survey called the Common Census Sports Map. Thus, every college football fan in America was, in theory at least, mapped to his or her favorite team. Although New York is the nation’s largest media market, and although Rutgers is the most popular team in the New York City area, its over all numbers were just average by this method. That’s because only about 15 percent of New Yorkers are avid college football fans, among the lower figures in the country. In addition, although Rutgers might be the most popular college team in the region, it hardly dominates the market, with many fans declaring allegiance to universities like Syracuse, Connecticut, Penn State or Notre Dame instead. Many New Yorkers are also transplants from other parts of the country, and bring their football allegiances with them. Only about 20 percent of college football fans in the New York region listed Rutgers as their favorite team. Therefore, although there are approximately 20 million residents in New York’s media market, only about 3 percent of these people are estimated to be fans of Rutgers football specifically. That’s about 600,000 people. There are also about 300,000 Rutgers football fans in other markets along the East Coast or elsewhere in the country, bringing the total to about 900,000. 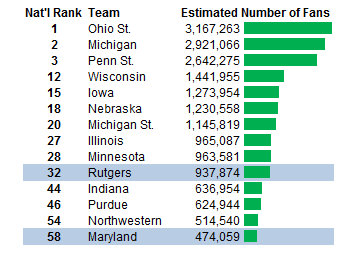 But that’s below the Big Ten average of 1.4 million to 1.5 million fans per team. Programs like Wisconsin, which is close to the average with 1.4 million fans, might not seem to have as much media muscle. But these universities often have the affinity of whole states unto themselves, states where college football is a religion on Saturdays rather than an afterthought. Maryland does somewhat worse still by this method. Although it is the predominant college football program in Maryland, the state has little passion for college football. And the program has little following outside Maryland’s immediate borders, where higher-profile teams like Virginia, Virginia Tech, West Virginia and Penn State tend to dominate. My method estimated that the University of Maryland has just shy of 500,000 college football fans, which ranks 58th in the country and which would be lower than any university now in the Big Ten. Maryland and Rutgers are not necessarily poor choices compared with some of the other logical alternatives. I count five other universities that are A.A.U. members, that play in a major college football conference, and that are either within a current Big Ten state or border one. Missouri, with about 1.1 million fans, is the most attractive of this group. But it recently joined the Southeastern Conference, after getting on-again, off-again attention from the Big Ten. Pittsburgh and Kansas rank somewhere between Rutgers and Maryland in terms of their fan counts. The last two universities that qualify for the list, Iowa State and Colorado, have about as many fans as Maryland does. The question, rather, is what the Big Ten stands to gain at all by expanding. Fans of a current Big Ten team might find their new schedules less compelling. Wisconsin Badgers fans, for example, will now have fewer opportunities to see their team play against regional rivals like Iowa, Michigan and Illinois. Those matchups will instead be replaced by more games against Rutgers and Maryland. Many college football fans also travel to road games, which bolsters business for local restaurants and hotels. It is about a three-hour drive from Madison, Wis., to Iowa City. But it is 15 hours to College Park, Md., and more than 16 hours to New Brunswick, N.J.
. But universities in the Northeast seem to reduce both the geographical integrity of the conference and the quality of the average Big Ten football game. It is probably no coincidence that the two most popular college football conferences — the SEC and the Big Ten — have until now been the most conservative about expansion. The most recent additions to the Big Ten, Penn State and Nebraska, ranked as the 3rd and 18th most popular football programs in the country. The newest additions to the SEC, Texas A&M and Missouri, were ranked 6th and 23rd. Rutgers and Maryland are outstanding public universities, but they are just not in the same league in terms of football. The Big Ten may have expanded its revenue pie, but it will be dividing it 14 ways rather than 12, and among family members that have less history of sitting down at the table with one another. In seeking to expand its footprint eastward, the conference may have taken a step in the wrong direction. A version of this article appears in print on 11/21/2012, on page B13 of the NewYork edition with the headline: Small Payoff In Expansion By Big Ten.